As the first term this year drew to a close and most schools were busy conducting examinations – many of them squeezing in two exams a day to make up for the unexpected loss of working days, we at Centre for Learning, Hyderabad, got down to our almost week-long exercise of self-assessments with the children. Almost a week spent by the children (mostly 10 years and above) and teachers huddled in a room just talking can seem to an outsider as a gross waste of time, when there is so much of the “syllabus” still to be covered, and so much time has already been lost due to various bandhs. But these exercises remind me, as they always have time and again, how amazingly self-reflective and honestly self-critical children can be when we repose faith in them.Not just that, they are also capable of providing the teacher some insightful feedback and criticism. The assessment exercise usually starts with one of the teachers introducing the children to the exercise we were doing. For the benefit of the newer children, she gives a few broad guidelines for looking back at the term – some of the key aspects that are suggested for each academic subject are understanding of concepts, coverage, interest, and confidence level in the particular area, effort, and feeddback on the respective teachers. In addition, there are some overall aspects like learnings that were personally important/exciting, behaviour, attitude, and level of responsibility shown. They are of course free to say anything else that they wish to about the term they just completed. Children are reminded that they are to measure their achievements against their own efforts and not compare themselves with others. After the initial and minimal introduction to the exercise, it is left open to the children to start off, in no particular order but leaving it to them to decide when each of them would like to take the turn to speak. Usually, children who have been longer with the Centre and have done this exercise a few times in the past, start off, as they know that they can speak their mind here without being judged. The newer children, with a little time and when they see the others speaking candidly, open up, if not the first time, very often, after a few sessions like this. Engaging with children to look at their own work and attitudes is a continous process through the daily routine. However, a milestone activity like this affords a different kind of space in two ways. One, since it is not related to an immediate task, or a particular behaviour that the learner has been involved in, there is a little more objectivity and a lesser need to be defensive. Secondly, as it is a collective exercise, seeing others look at themselves, makes children feel more secure in doing it themselves, and also helps them see that failure and weaknesses, are acceptable and not shameful to admit. In the group of 8-12 year olds, Radhika who is 9, turning the pages of her English notes, felt, spellings was one area that she needed to work on. One 8 year-old felt he needed more practice in division. Giving their criticism on the teachers, a 9 year old said, “Although your handwriting on the board has improved, your writing in the books is still too difficult for me to understand,” – (the ‘still’ was because she had told me not to use running handwriting in the last couple of assessment sessions too!). And as another 10 year-old said, “Sometimes when you are angry with one of us, you also tend to show that anger with others”. Both these criticisms I had to accept as true, when I thought about them. Anthony, a 15 year-old, who has been in and out of the Centre a few times, talked of how on the one side, he really wanted to study and would resolve to do his work at home, and how once he reached home, he would get totally overwhelmed by the urge to watch TV, or to go out with his friends and then would come back very late. Talking about his significant learnings in the term, he mentions the visit to the cancer hospital and says, “I know all the bad effects of smoking, but I still somehow cannot stop smoking totally”. We talk about his problem with TV and friends and how we could together overcome it and think of a few ideas that we would try out – including his coming to a teacher’s home to do an hour of study time with her. Clara, a 13 year-old, feels she hasn’t made any progress at all this term. With stark honesty, she admits that sometimes she just gets very bored with most of the academic subjects and then the quality of her work slips. When asked what interests her, she mentions dance and embroidery. As we go along, we came to know that Arun feels his interest in math has gone up this term, but still doesn’t feel very confident, he also thinks he gets into fights and scuffles much less now compared to last year, Navya is satisfied with her progress and thinks she has put in her best efforts. She loved her dance and singing, Rajesh and Suresh enjoyed compering for the Independence Day and enjoyed dancing on the stage for the first time in their lives. At the end of the sessions, we not only had an idea of how the children felt about their progress in academics, but also about what excited them, what kept them from doing their best, situations at home, their interests, and what they thought about their attitudes. Examinations are useful tools of assessment. If designed well, they do help to evaluate a learner’s understanding and to some extent application of their knowledge. However, they still can only throw light on WHAT the learner doesn’t know. They are limited in scope in answering the question, WHY has the learner been unable to learn what is expected in the examination, and treat the learner as a black box, in the sense that it just measures the output (read: performance of the learner) with respect to the input that she has got in the classroom in a particular period. Self-assessments, on the other hand, provide insights to the teacher into the learner as a person, her motivations, interests, what is personally meaningful to the learner and the different persona within that person and also help the learner become more self aware, which in itself is a valuable end. For an exercise like this to be truly meaningful in an educational space, it demands that the role of teaching itself moves radically – from treating it as a job of efficient delivery of a present syllabus to that of a sensitive, caring, critical thinking, dialectic engagement with learners – from a 9 to 5 job to that of an act of love. Otherwise, an Anthony’s situation can be quickly dismissed as one of individual irresponsibility and utter waywardness instead of seeing him as a product of his circumstances and context, and also seeing that side of him attempting to overcome his situation, weak, but still alive and trying! Clara’s frankness in admitting to boredom in most of academics can easily be dismissed as sheer indolence (which is a possibility but not a certainty! ), without raising deeper questions on the epistemic skewedness of what we deem as important knowledge – marginalizing and devaluing crafts and almost glamourizing the intellectual. For an educational space that genuinely believes that a learner-teacher relationship can be democratic and is seriously committed to helping learners become self-motivated and independent learners, self assessment is not only a very important evaluation exercise, but is, in itself a direct and important learning activity towards the achievement of curricular aims. 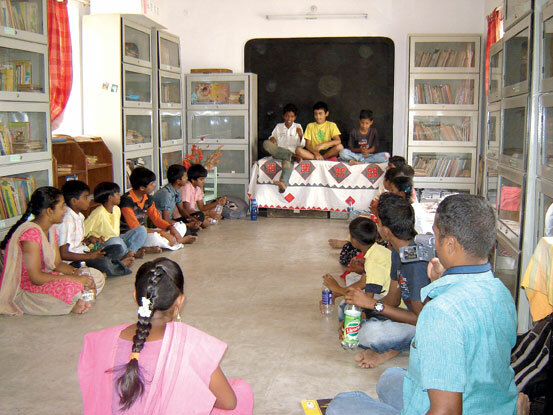 The author works with the Centre for Learning, Secunderabad. He can be reached at knramgopal@yahoo.com.